It’s a common complaint of people in business: E-mail is this great big blob that consumes way too much of their day. And now we know just how much. According to a recent report published by Adobe — “E-Mail Survey 2016,” — white collar adults around the world are spending ~17% more time on e-mail activities today compared to last year. And on the business side, the growth is even bigger. According to the findings of this research, which included surveys of ~1,000 American and ~3,000 European white collar workers, the time spent on work e-mails on a typical day is ~4 hours, while personal e-mail communications account for an additional ~3.3 hours. This combined total of nearly 7.5 hours means that nearly one third of the typical day is spent working with e-mail communication. Those findings suggest that other than sleeping, people spend more time on e-mail than on any other type of activity. How frightening is that? Contributing to the “always on” atmosphere, is the fact that smartphones have definitely become the “go-to” device for e-mail activities. Nearly 85% of the survey respondents reported that they check e-mail regularly on their smartphone, compared to around 70% who check their desktop or laptop regularly for e-mail. In the workplace, the two devices are used approximately equally for e-mail activities, but on the personal side, smartphones have it all over other desktops and laptops. Nearly two-thirds report that they use their smartphones regularly for e-mail, compared to fewer than 30% who use other devices. 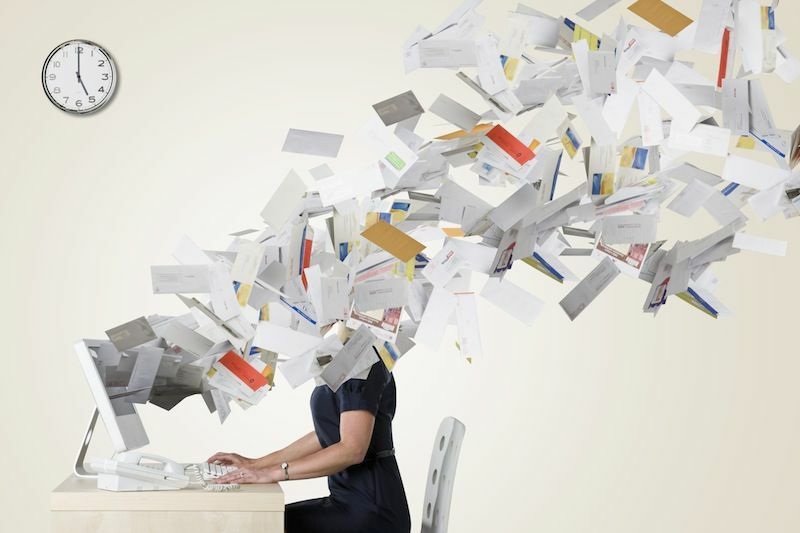 This means that two-thirds of work-related e-mails elicit a response from the recipient in two hours or sooner. But believe it or not, that’s not good enough; nearly three-fourths of the respondents expect to receive a response to their e-mail within that time period. What this research proves is that although many people like to complain about e-mail communications taking over their lives, it’s actually become an integral part of daily life, to the degree that those same people are now conditioned to expect e-mail engagement in real-time. In short, “always on” e-mail is now the norm. And if you don’t like that very much, there’s basically nothing you can do about it. For more information on the results of the Adobe research, click here. ← Social media: The biggest casualty of the U.S. presidential election? JCPenney found 45% of its WiFi was being used by employees managing their private lives. A major factor at play in e-mailing for Americans is our long work day. So much for these devices and media “empowering” us. You gotta be kidding. I have no smarthpone and I won’t have one unless someone puts a gun to my head — and even then, I might use my head for thinking. We have to keep in mind whom the Internet is designed to serve. It’s free. Yeah. Which means that someone has to pay for the woman- and manpower and the infrastructure “provided” to us. In reality, the money we spend on buying crap we don’t need is what pays for inundating us with endless ads to buy crap we don’t need. This does not take into consideration the human price we pay by having our attention blood-sucked from any reality in our lives. Friends of ours recently published a book titled Breaking the Trance. It deals with what’s called “screen dependency”, mostly in young people. But the statistics you cite would suggest that most adults are as hooked, except that their excuses are better than those of gaming juveniles. Personally, I try to use the computer and the Internet only as a tool. I write, I create art, I shop, I communicate with very few people. I do not engage in clouds other than those I see when I look out the window. My main programs are between 20 and 25 years old. I have customized them to work lightning fast. My way. If something like a portal doesn’t work for me but tries to put the nose ring of engagement on me, there is always ALT-F4. If I’m asked multiple times to fill out a survey about a purchase I made or why I didn’t make it, I have a template telling them to take a long walk off a short pier. Still, I spend too much time at this thing and run away to build fences, barns, replace starters or headlights or feed goats and chickens and build roofs … blessed tangible reality.